5418 17BI 1 Mk. Carmine red, 26:17 perforation holes, the scarce perforation, fresh colors and very well perforated, in perfect condition unused, photo expertize \"the quality is perfect\" brown BPP. 5419 ∆ 17BI 1 Mk. 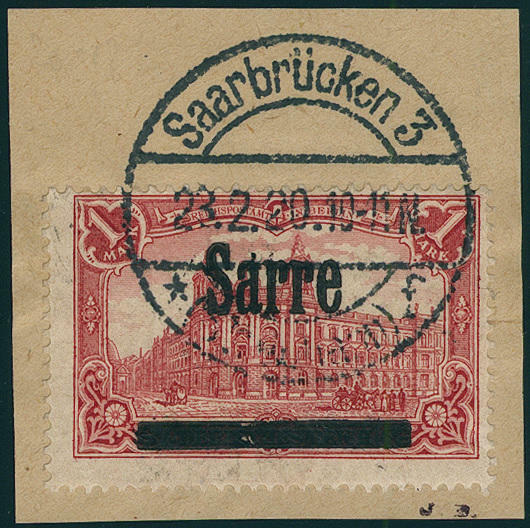 Carmine red, scarce perforation 26:17 perforation holes, wonderful fresh colors and very well perforated on magnificent letter piece with perfect stamp \"SAARBRÜCKEN 23.3.20. \". An outstanding quality for the highest standards! Photo expertize \"the quality is perfect\" brown BPP. 5420 ⊙ 17BI/IV 1 Mk. 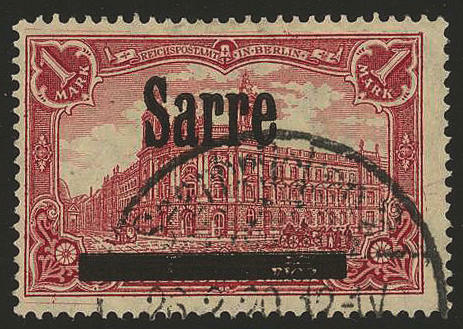 Sarre-Germania with rare perforation 26:17 perforation holes and additional overprint variety \"sharpen an IN SARRE\", fresh colors, perfect perforated and neat cancelled \"SAARBRÜCKEN 26.2.20. \". 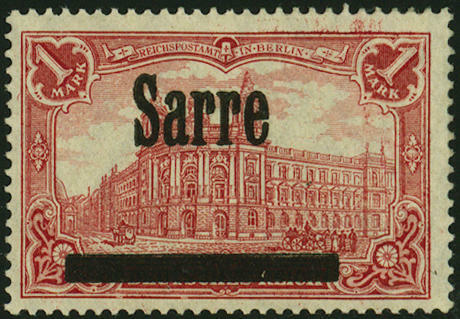 An outstanding quality this large old Saar rarity, from which only very few examples have become known! Photo expertize \"perfect quality\" Burger BPP. Michel 4000,- €. 5421 17BIV 1 Mk. 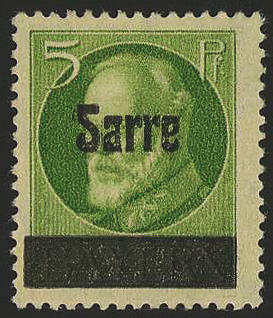 Red with overprint Sarre, scarce perforation 26:17 perforation holes, as well overprint variety \"sharpen an in SARRE\", fresh colors and very well perforated, in perfect condition unused. Great rarity the old Saar time! Expertized Burger BPP. Photo expertize Ney BPP. Michel 3000,- €. 5422 ⊙ 18/26b 5-60 Pfg. 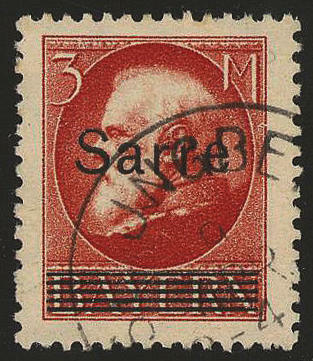 Bavaria Sarre, neat cancelled, as well 15 Pfg. In all three colours, as well 60 Pfg. In both colours, expertized Burger BPP respectively brown BPP. Michel 179,- €. 5423 18Probe 5 Pfg. 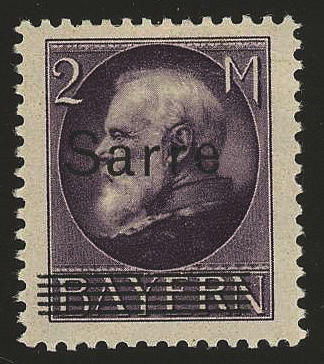 Bavaria Sarre, sample overprint \"plain the common Roman type\" of the company Flinsch / Frankfurt/Main, in perfect condition unused. 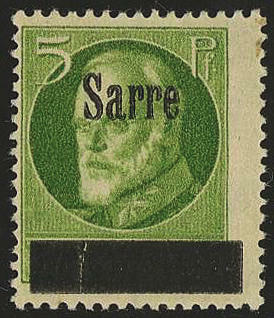 An old Saar rarity, of which only a few specimens were produced. (see Saar handbook page 202, proof 2 b). Photo expertize \"the quality is perfect\" brown BPP. 5424 18Probe 5 Pfg. 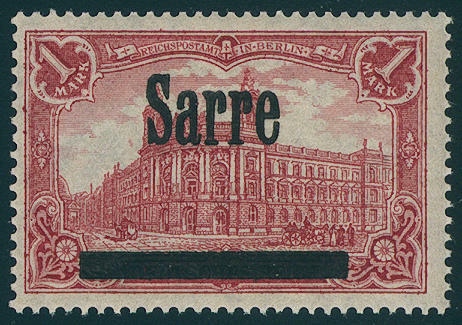 Bavaria Sarre, sample overprint \"plain the common Roman type\" of the company Flinsch / Frankfurt/Main, the overprint \"SARRE oblique standing\", in perfect condition unused. It were only a few Sample imprint produced. (see Saar handbook page 202, proof 2 c). Photo expertize \"the quality is perfect\" brown BPP. 5425 18Probe 5 Pfg. 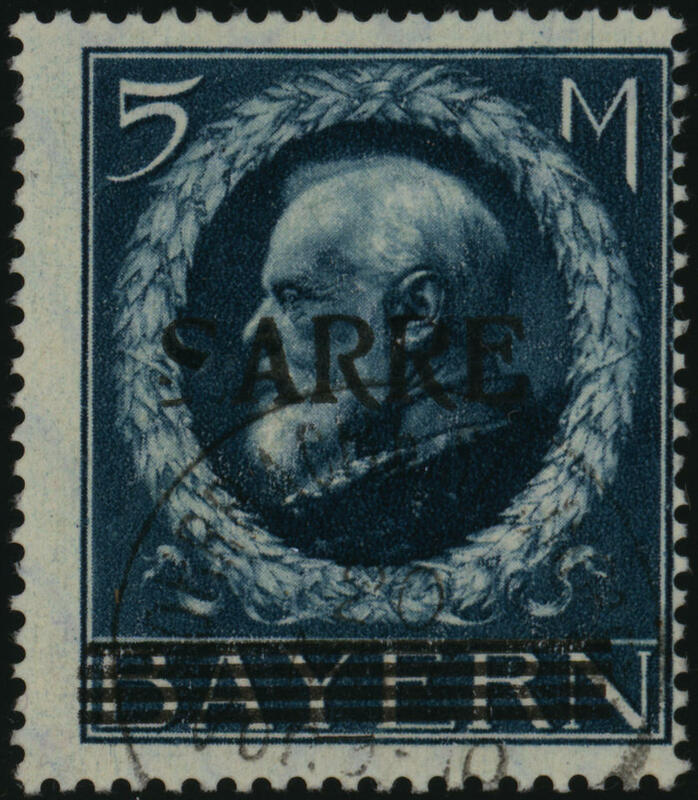 Bavaria Sarre, the very scarce sample overprint \"close thickly ARTISTIC WRITING WODAN\" of the company stamp / Frankfurt/Main, in perfect condition unused. It were only a few examples produced. (see Saar handbook page 202, proof no. 4 b) photo expertize \"the quality is perfect\" brown BPP. 5426 18Probe 5 Pfg. 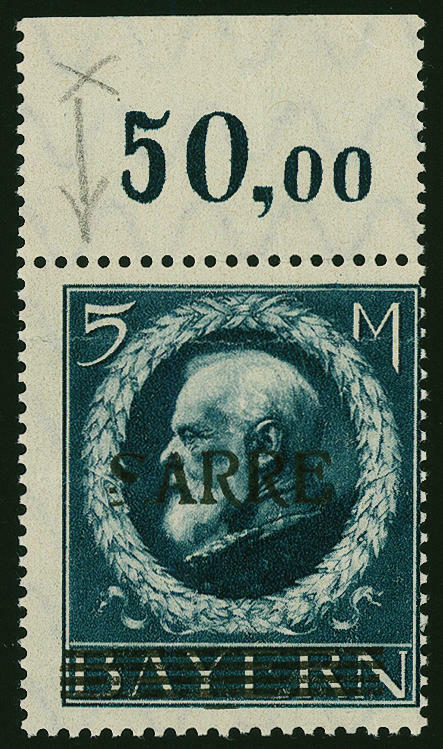 Bavaria Sarre, the very scarce sample overprint \"close semi-fatty Renaissance\" of the company stamp / Frankfurt/Main, in perfect condition unused. (see Saar handbook page 202, proof no. 5). It were only a few examples produced. Photo expertize \"the quality is perfect\" brown BPP. 5427 18Probe 5 Pfg. 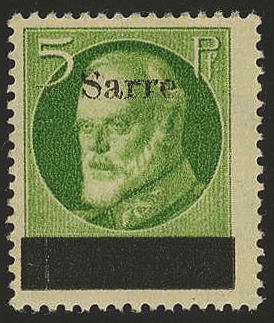 Bavaria Sarre, sample overprint \"semi-fatty RENATA I. Set\" of the company cancer / Frankfurt/Main, in perfect condition unused. It were only a few examples produced. (see Saar handbook page 202, proof no. 8 a). Photo expertize \"the quality is perfect\" brown BPP. 5428 ✉ 27a 1 Mk. 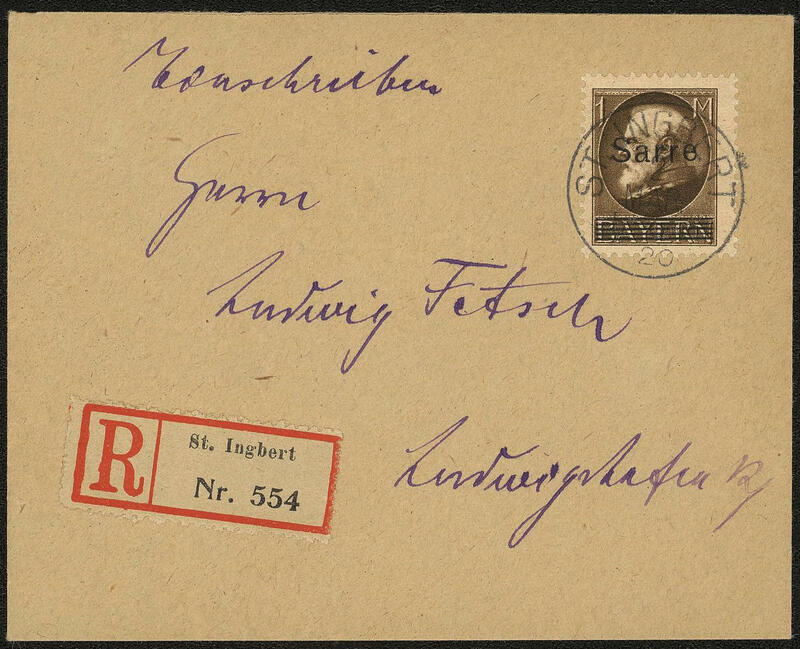 Bavaria Sarre as faultless, not correctly franked single franking on beautiful small-format registered cover from \"ST. INGBERT 2. March 20. \" to Ludwigshafen with arrival postmark, expertized Burger BPP. 5429 28a 2 Mk. Bavaria Sarre in the very rarely colour \"black purple violet\", wonderful fresh colors and in perfect condition unused with original gumming. 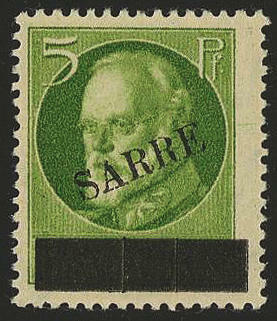 The overprint on the peace printing issue is extraordinarily rare and is absent in almost all collections! Photo certificates Burger BPP, brown BPP. 5430 ∆ 28bI 2 Mk. 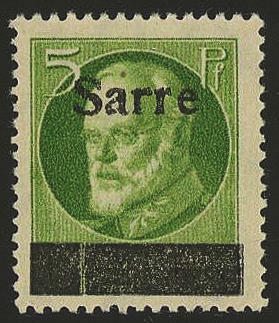 Bavaria Sarre with overprint variety \"6 in lieu of 5 grid lines\", fresh colors and in perfect condition on piece with clear single circle postmark \"HOMBURG 14. April 20\", photo expertize \"perfect quality\" Burger BPP. Michel 450,- €. 5431 ⊙ 29 3 Mk. Bavaria Sarre, fresh colors and neat cancelled \"ST. INGBERT\", photo expertize \"genuine and immaculate\" brown BPP. Michel 200,- €. 5432 ∆ 29Abart 3 Mk. 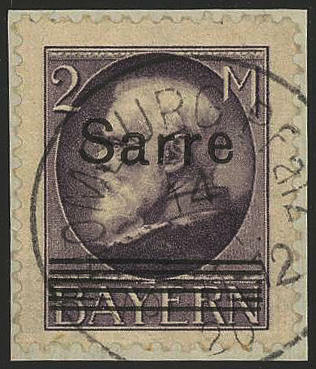 Bavaria Sarre with extremely strong defective or badly placed perforation, through it the country inscription \"Bavaria above in lieu of at the bottom\" on very nice white letter piece with neat postmark \"SAARBRÜCKEN 18.6.20. \". Very decorative and extremely rare! Photo expertize \"the quality is perfect\". 5433 ✉ 30 5 Mk. Bavaria Sarre from upper margin, wonderful fresh colors and in perfect condition as very nice, not correctly franked single franking on decorative small-format registered cover from \"ST. INGBERT 2. 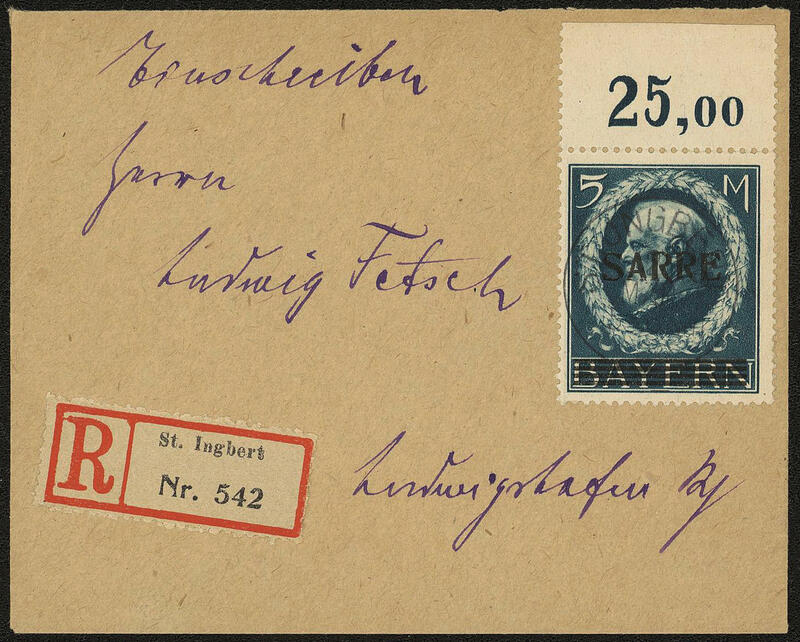 March 20\" at Ludwig Fetsch in Ludwigshafen with arrival postmark. Herewith is a the there postmaster. Exceptional attractive and very rare! Photo expertize \"perfect quality\" Burger BPP. 5434 30I 5 Mk. 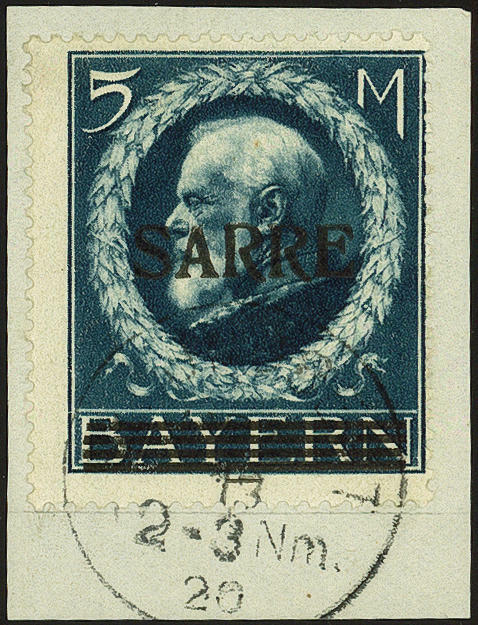 Bavaria Sarre with scarce overprint error \"mutilated S from SARRE\", upper margin copy mint never hinged, horizontal trace of crease, an extraordinarily scarce variety, photo expertize brown BPP. Michel 5000,- €. 5435 ⊙ 30I 5 Mk. 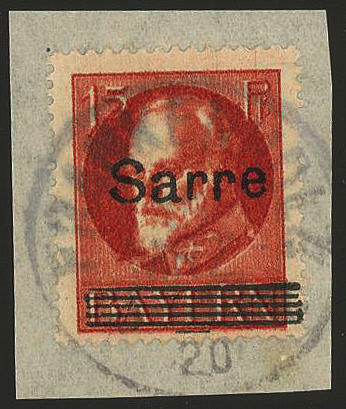 Bavaria Sarre, wonderful fresh colors and very well perforated with very rare overprint variety \"mutilated S from SARRE\", neat cancelled \"ROHRBACH 20. MRZ. 20\". Old Saar rarity in perfect condition! Photo expertize Ney BPP. Michel 3500,- €. 5436 30II 5 Mk. 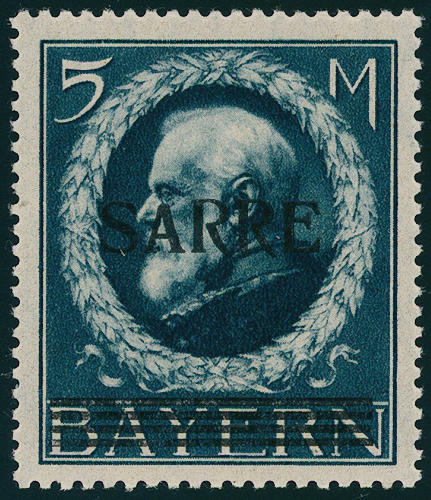 Bavaria Sarre with very rare overprint variety \"small A IN SARRE\", wonderful fresh colors and very well perforated, in perfect condition mint never hinged a Saar rarity in perfect condition! Photo expertize Burger BPP. Michel 4000,- €. 5437 ∆ 30II 5 Mk. 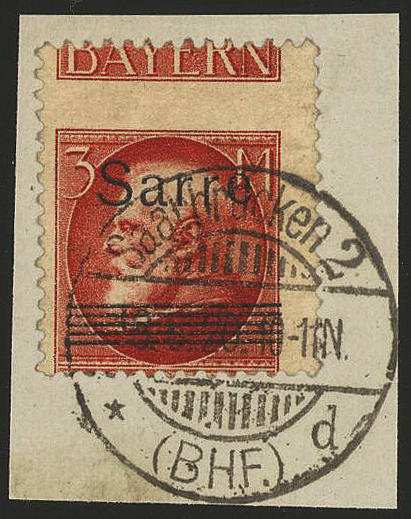 Bavaria Sarre with very scarce plate flaw \"small A IN SARRE\", which only on field 15 in the sheet occurred, wonderful fresh colors and very well perforated on beautiful white letter piece, neat cancelled \"ST. INGBERT 13. MRZ. 20\", utterly perfect condition, photo expertize brown BPP. Michel 3000,- €.